The Vail Farmers' Market is focused on farm and food products and attracts over 50,000 visitors each year. The selections change weekly and there is also an abundance of arts and crafts. More than just a farmer's market, the Vail Farmers' Market is an exciting and entertaining event. Overview: Nearly 60 tents appear each week when the farmers arrive early every Sunday morning with refrigerated trucks loaded with freshly picked fruits and vegetables. Other vendors show up to sell their fresh make bread, pastries, cheeses, and ice creams. If you desire pasta, pickles, brats, Thai specialties, honey, jams, jellies, chocolates, salsa, vinegar, soaps, dog biscuits/treats, wines, jerky, coffee beans, smoked salmon and much more, you can find it at the Vail Farmers' Market. The selections change weekly and there is also an abundance of arts and crafts. More than just a farmer's market, the Vail Farmers' Market is an exciting and entertaining event. Details: Stop by each week for something new. Live music and samples are readily available. 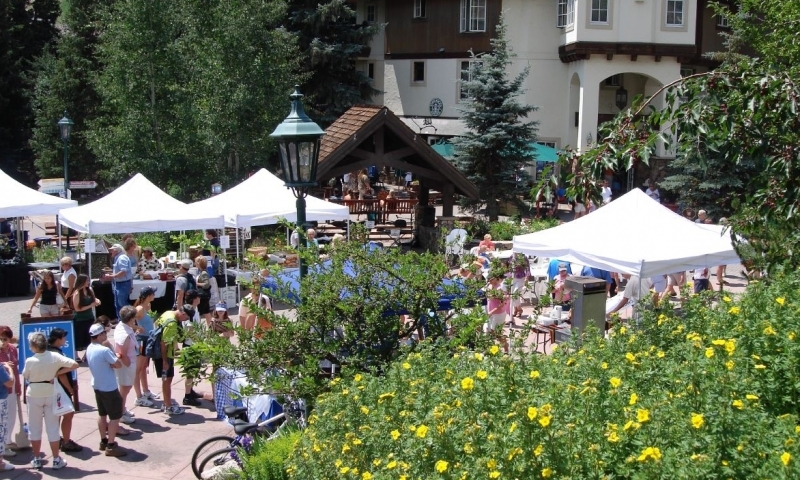 Find more information on the Vail Farmer's Market and Art Show website.